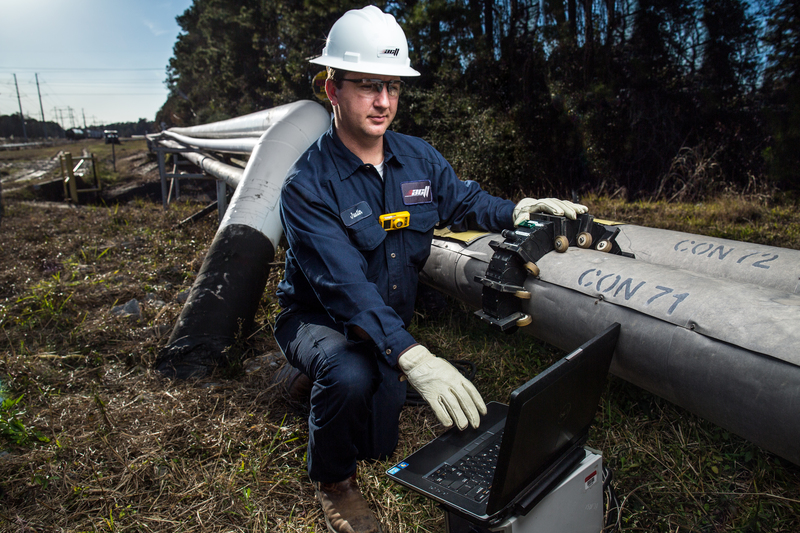 Advanced Corrosion Technologies & Training is proud to introduce the next in a long line of advanced corrosion detection tools, the Bracelet Probe. The Bracelet Probe is a revolutionary electromagnetic NDE inspection technique for detection of external corrosion in pipes, vessels and tanks with coating, fireproofing and/or insulation. Inspections can be performed in-service without interruption and without removal of insulation and fireproofing. The rapid inspection is performed from the exterior of the insulation or fireproofing with our innovative and specially designed scanners. A single scanner can fit a wide range of pipe diameters and vessel sizes. The technique is sensitive to both isolated and general corrosion. Test data is presented in both strip charts and real-time color maps.